Students returning to school on Monday, October 23rd will find the same cafeteria staff ready and waiting to greet them Monday morning for breakfast. However, what's being served will change, not only for breakfast, but lunch as well. The start of the second quarter finds Mohave Valley's Food Services being managed by Chartwells, a nation-wide provider of school food services. Chartwells currently provides services for Bullhead City Elementary and Colorado River High School Districts, so bringing Mohave Valley into the fold will likely be a smooth transition for our students and staff. While staffing likely won't change, what will change is an increase in meal options. Students will have several choices for both breakfast and lunch- something the district could not provide due to staffing limitations. Students will always have 3-4 entree choices for lunch, plus access daily to a fresh food "finishing bar" loaded with fruits and vegetables. 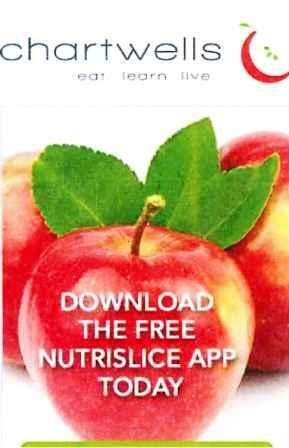 Parents and students have access to menus online through http://mvesd16.nutrislice.com/, and can also download the Nutrislice App free through the Apple or GooglePlay store. Both the App and online version are quite detailed: Simply hover over the desired menu item to see the ingredients, as well as a link for special diet information. At this time the district website and app will take patrons directly to the Nutrislice site when clicking on the Menu tab in both the district app and on the district website. As always, parents are encouraged to come and enjoy a meal with their child for a nominal cost for the adult meal. What better way to start the day than to share breakfast with your child! As always, student meals continue to be free for breakfast and lunch. For more information, contact your school cafeteria staff, or Mr. Jody Cheever, Director of Dining Services at 928-219-3120, or via email at jody.cheever@compass-usa.com.